Adding a full featured IDPS solution like Suricata is a good step in protecting any Web based application like WordPress, but how well will it fare when under attack? In all scenarios, the Acunetix scan was configured with the default scanning profile targeting a Enterprise Linux based host with PHP installed. The WordPress version is 4.2.2 and no plug-ins are installed. The rule files used from the Open Ruleset were the same as with the Pro Ruleset. There is only a difference in the filename, in the Open Ruleset it starts with emerging-* but in the Pro Ruleset it does not. Even though the only noticeable difference is in the names of the files, the Pro Ruleset contains rules that the Open Ruleset does not. Hence the usage of both sets for the tests. There is an extra 52 alerts using the Emerging Threats Pro rules. 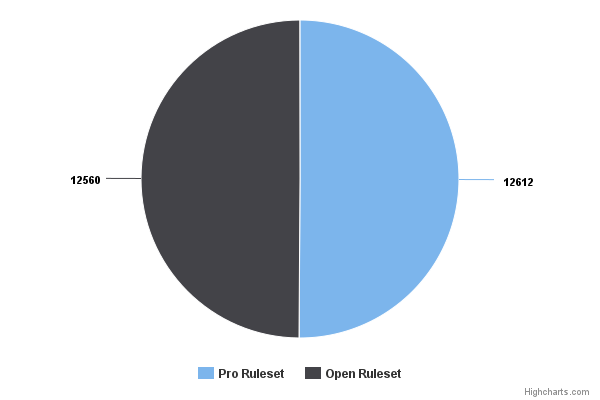 From this 52, only 14 are generated by Pro only rules were the other 38 are generated by rules that are also present in the Open Ruleset and were simply alerted in greater number in the third run. Alerts generated by Pro only rules. In total the Acunetix scan with the rules that were used (downloaded 6 of July at 15:26) generated 12612 alerts with the Pro rules and 12560 for the Open rules. 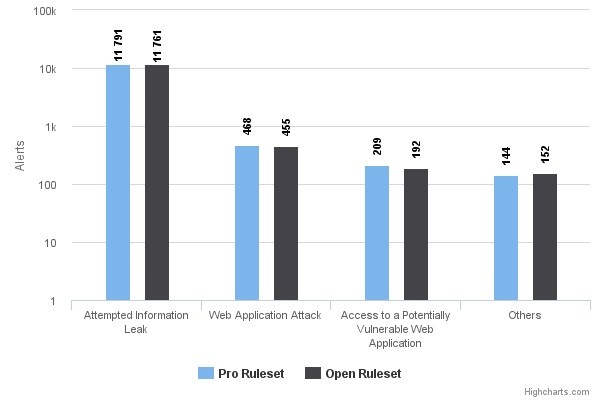 It is then possible to conclude that there isn’t much difference between the Pro and the Open Ruleset when it comes to vulnerability scans performed by Acunetix WVS (and possibly also against other scanners). Total alerts generated during the tests. The breakdown of the alert categories is pretty even and differences are almost negligible if we take into account the range of the numbers involved. Acunetix reported 1 high, 2 medium and 27 low risk vulnerabilities. 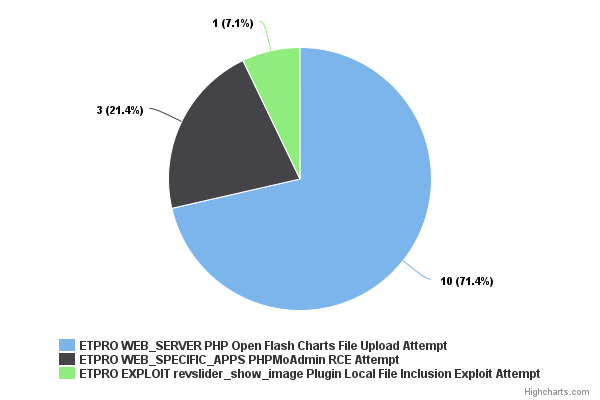 Out of those, the only ones that were related with WordPress and that could be actionable (read, no false positives) against the WordPress installation is 1 medium and 1 low risk vulnerabilities. All of them would have been mitigated by Suricata (independently of the rule set used) by the following rules. In conclusion, Suricata faired extremely well in terms of performance and security/protection alerting to attacks that ranged from SQL injection to known vulnerabilities in WordPress plugins.